Manufacturers are insistent that light switches and smartphones should converge, and who can blame them? Star Trek-like touchscreens in every room could turn the humble switch into a do-everything vision of the future. Alas, like the Wink Relay before it, Brightswitch is not the product that will get us there. The concept is straightforward. 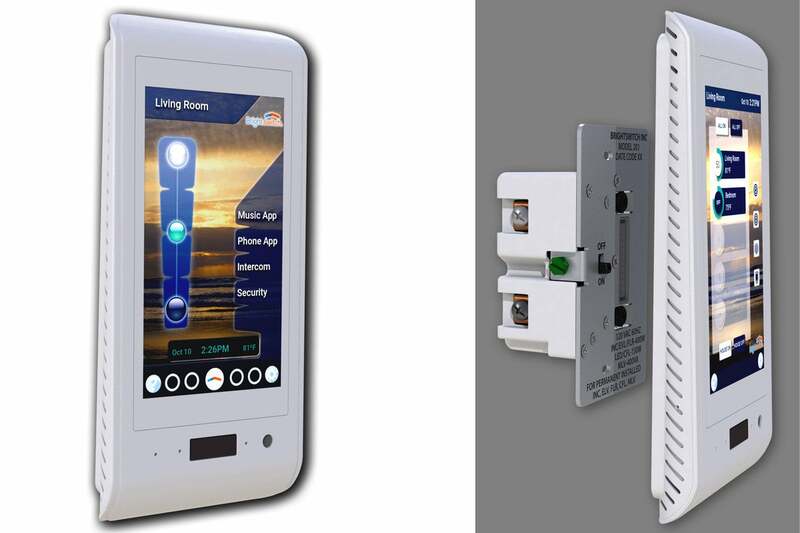 A base unit, an oversized device much like any modern dimmer switch, connects to your existing switch wiring. This base then connects through a custom connector on the front to a low-end Android device, clad entirely in white plastic, that sits on top of it. Once attached, it has the distinct appearance of a chunky smart phone that’s been glued to the wall. There's a lot of Brightswitch that needs to fit inside the junction box. Getting to that point isn’t easy. 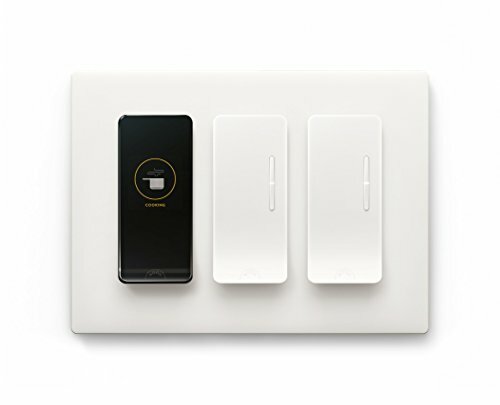 The Brightswitch requires wall power (white wires), a ground, and connection to your load and line wiring (black wires). In a rare turn, the Brightswitch actually works with three-pole configurations, but that means even more wiring is necessary. That’s problematic because, assuming you have typical house wiring, the industrially-styled Brightswitch is designed to connect via push-in backstabs, which must be tightened down with a screw on the side. There are two backstabs per screw (for a total of eight on the back of the base), and if your electrical box has three white wires, say, you’ll need to do some extra work; in my case, that meant trimming and stripping a piece of scrap wire and attaching it to the other three white wires with a wire nut. As is typical with most switches, a separate ground wire is also required, but this connects through an external screw. I spent a solid 10 minutes trying to wedge my ground wire into the recessed channel in which that screw is located, and another 10 getting all the other wires properly seated. My best advice: Rely heavily on needle-nose pliers. 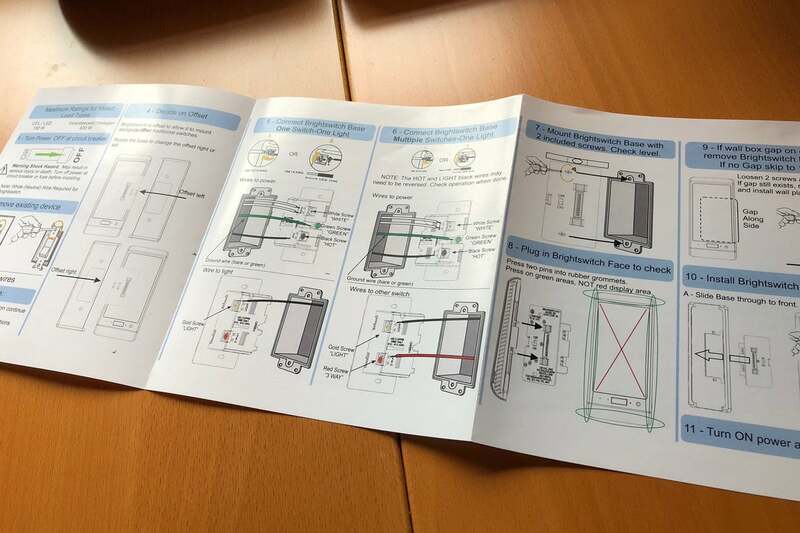 Brightswitch’s daunting installation manual notes that you can, in theory, use the screw terminals to connect wires instead of the backstabs. I attempted this by loosening one of those screws, only to have that screw fall out into my hand. The problem: The nut to which that screw connected also fell out, but inside the sealed base mechanism. Without a nut on the other side, there was no longer anything for the screw to attach to, and no way to attach wires using either the screws or the backstabs, effectively bricking the base altogether. Brightswitch’s security alerts leave something to be desired. Fortunately, I had two switches to work with, and I avoided that mistake with the second one, finally wedging all this extra wiring plus the Brightswitch base back into the junction box. I was almost amazed when it powered up after turning the circuit breaker back on following a solid half hour of effort. Two of the four app shortcuts are locked to Security and Intercom features. The user can choose the other two apps to appear in this shortcut list. Brightswitch provides two by default, preinstalled: Google Play Music and Google Calendar, the latter of which is a particularly curious app to have on your light switch. Not interested? You can add your own apps via the standard Google Play store. Dig into the settings, open the Google Play shortcut, and you’re kicked out into a standard Android interface. Here you can use the Brightswitch like any Android tablet, including downloading third-party apps. I installed YouTube on the thing and, after about 10 minutes of downloads and updates, was able to watch a Simpsons clip on my light switch: The future has arrived, people. To return to the Brightswitch interface, you just tap the icon that appears in the dead center of the screen, where it overlays whatever it is you’re doing. If you want to use the Brightswitch as a music player—not a terrible idea—you’ll need to connect it to an external Bluetooth speaker, as the internal speaker isn’t sufficient for tunes. The pairing process took me three tries, but eventually I got things connected and working. You’ll need to stream your music via an app over Wi-Fi, of course, because you can’t load music files directly onto the device, but it all worked well enough. This is roughly half the installation instructions (online user guide not shown). 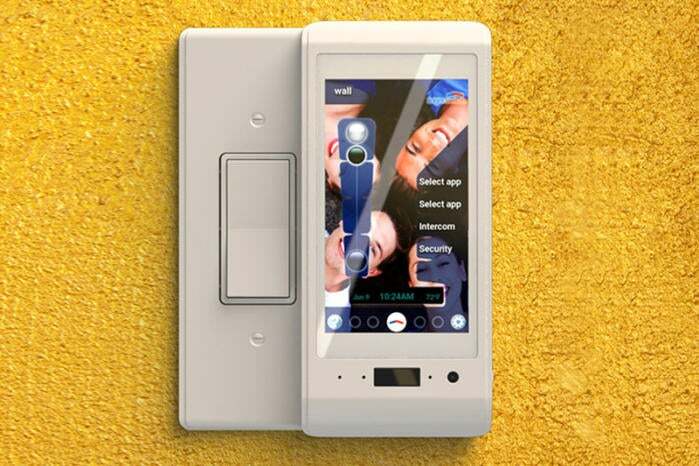 Another feature of the Brightswitch is the Security system, a widget that’s designed to let you use the device as a full-on alarm system, complete with motion detection and photo recording when the sensor trips. This couldn’t be more complicated to configure or use, but at least it does work, for the most part. 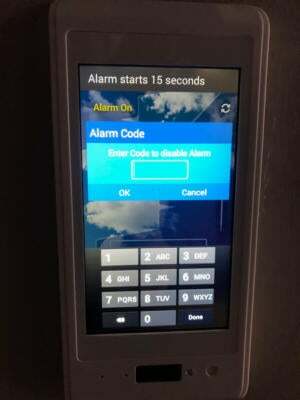 Punch in a code and you are given 60 seconds to leave. If the sensor detects motion after that, it sends you a text message that the alarm has been tripped along with a picture of the room, all while blaring the creepiest siren I’ve ever heard. In my testing, though, the function was very erratic, sometimes with the alarm erupting in a sealed-shut, empty room, sometimes with the attached photograph so murky and dark as to be useless (see screenshot). If you’re still not daunted by this commentary, you can try getting Brightswitch to work with a Z-Wave hub, such as Wink or SmartThings, so you can use the Wink/SmartThings app to control the Brightswitch. 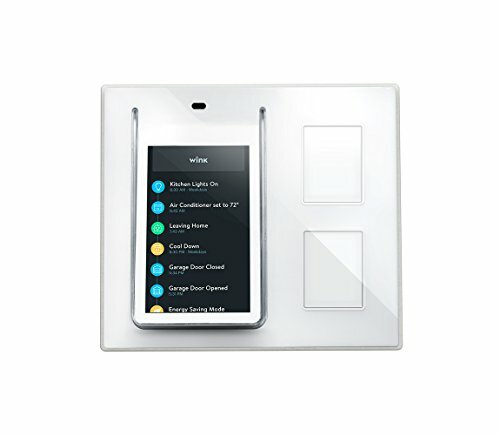 (You can also configure Brightswitch to control Z-Wave light bulbs elsewhere in the house, which technically makes it both a hub and a node on a Z-Wave network.) I never got this to work at all. Brightswitch referred me to its longwinded user guide, which was really no help. As well, a printed addendum in the box notes (among several other bugs) that “When controlling Brightswitch with a Wink hub you may notice erratic behavior. We are working on this problem.” Ultimately, I decided to concede this battle to the gizmo. If I leave you with one thing, it’s that it’s impossible to overstate how convoluted all of this is – not to mention incredibly slow and punctuated with freezes and crashes. It’s so unintuitive that I expect anyone who’s not attracted to the device for its geek novelty value will quickly become frustrated to the point of anger. To put it another way: I’m already removing it from my wall. Correction: This story was updated shortly after publication to correct its byline. Android tablet as smart light switch? It’s not a terrible idea on its face, but the implementation here is a disaster.